You are currently browsing the Archaeofacts.com archives of Musings for the day Monday, October 12th, 2009. 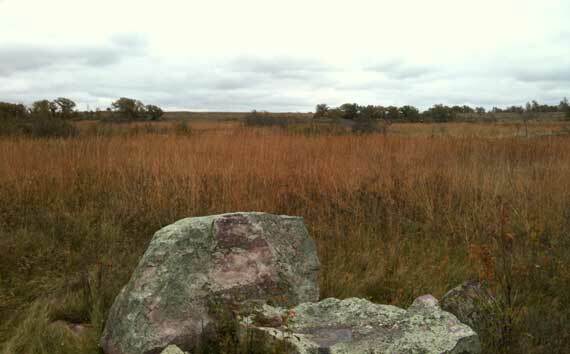 Quite a combo: the quartzite outcrops in the (almost) tallgrass prairie. This is at Pipestone National Monument. The pipestone is a band beneath a quartzite layer. Both settled out of a long-gone sea. The coarser sands formed into the quartzite, while the finer clays became the pipestone. If I have it right…. Anyway, they still sell the little turtle figurines you may remember from when you visited aeons ago (as I did), but the modeling style has switched to angular. I assume the rounding took too much time, so the artists now just saw out the figure and sand the sharp edges a bit, then move on to the next stone bit. The fresh snow that came through this morning was mostly melted by the time we walked the Pipestone trail, but the remaining bits of white and the heightened color of the well-watered lichens (both greys and not-greys) made it spectacular, even under pewter skies. The picture makes it look nicer than it was.